From photocopiers to trucking technology to equipment financing, Edward Siciliano has seemingly spent time selling a little bit of everything. And as the new CEO of CAN Capital, he’s looking for ways to apply his marketing background to the data-driven world of fintechs. Q: Tell us a little bit about your background, both educational and professional. A: I’m a New Jersey native and stayed in the Garden State for school, graduating from Rutgers University with a marketing degree in 1985. I’ve been focused on sales and marketing ever since, first at Xerox where I spent 10 years and then heading sales and marketing for a couple of tech firms, AppliedTheory and ALK Technologies. I first entered the financial space in 2007 with Marlin Business Services, where I spent 10 years and held roles as chief sales officer, then interim CEO and ultimately COO. That’s where I got a crash course in scaling an organization. Soon after joining Marlin the recession hit, and I was forced to dismantle the sales organization from 138 to 30 employees. After helping to guide the company through that difficult period, I headed several initiatives to build the business back up, including rebuilding our sales force, adding new products and improving operations. We succeeded beyond everyone’s expectations, generating double-digit ROE and growing our originations from $60 million to $600 million. It was an incredible experience and one that is very analogous to the work I aim to do at CAN Capital. CAN has an extremely strong foundation, but it has been through some challenges recently. I’m excited to work with the team to once again make the company a leader in alternative small business lending by both building on CAN’s heritage and expanding its reach into new areas that will allow us to build even deeper relationships with our customers. Q: You’ve had a varied career, starting out at Xerox and then working in sales in the tech industry. What led you into small business lending? A: At every stop I had prior to Marlin, we were providing goods or services to help small businesses succeed — and that really left an impression on me. I saw the hard work and dedication it takes to run a successful small business and the impact they have on their communities. That’s why when the opportunity at Marlin came up, I couldn’t wait to join the cause. I also think this is an interesting time for our industry. Small businesses are a huge driver of the U.S. economy, and banks are not serving them well. Given current economic volatility, this situation is likely to get worse before it gets better. There’s a massive opportunity for fintech companies like CAN Capital to fill that gap. As big as the sector has become, there is still a lot of room for growth. There are more than 30 million small businesses, many of which need investment capital but may not be fully aware of the speed, efficiency and customer-focused service that fintech companies like CAN Capital provide. Q: What drew you to the position at CAN Capital? A: After Marlin, like many top executives, I signed a non-compete agreement. Although I couldn’t take a full-time role while that agreement was in effect, I spent the time talking to people within the industry and closely following new developments as I thought about my next opportunity. Those conversations led me to Gary Johnson and Varadero Capital. As I learned more about CAN Capital and the growth opportunity that exists, I realized we shared a vision for the company’s next stage and that it was a perfect fit with my experience. I was excited by the opportunity to join a company that is a pioneer in using technology to support small businesses. While CAN Capital has gone through a few hiccups, it was immediately clear to me that the company has a strong foundation built on 20+ years of experience gathering data and insights into the needs of the small business community. The company also has a long track record of solid customer and partner relationships. Q: What advantages do you think a fintech lender gives a small business versus a traditional bank? A: I’m a firm believer that small businesses are the heart of the American economy. Yet these businesses are not being well served when it comes to financing. Banks often won’t lend to small businesses because the amounts most owners need are not profitable enough for the banks when you factor in their overhead costs. With current economic volatility and the increasing likelihood of another downturn, I expect banks to pull back further in the coming months. Even when they do say yes, big banks are often slow and inefficient, which means small business owners wind up spending time on paperwork instead of running their businesses. Fintech companies like CAN Capital have a massive opportunity to bridge this gap by providing fast, efficient access to capital. There are over 30 million small businesses, so as big as the alternative financing sector has become, there is plenty of room for growth. The key is focusing on the needs of the small business and providing a first-rate, technology-driven customer experience. Our goal is to help more small business owners get access to capital to expand their businesses and live out their dreams. Q: In what ways do you plan on growing CAN Capital? What are the projects you’re most excited about? What are the areas you want to strengthen? A: Let me start by saying there are a ton of strengths to build on here. CAN has innovative technology and a really solid credit model that got the company through the Great Recession in 2008. On top of this, we have a tenured staff, a large customer base and have provided over $7 billion in working capital since inception. That’s a great foundation to build a new strategy from. My job coming on board is to accelerate the business. I intend to do this through investments in technology to add more products and improve the customer experience. It’s very powerful to repeat business with a customer, but to do so you need a variety of products. Right now, we primarily offer working capital loans, with MCAs making up the remaining 5% of our offerings. 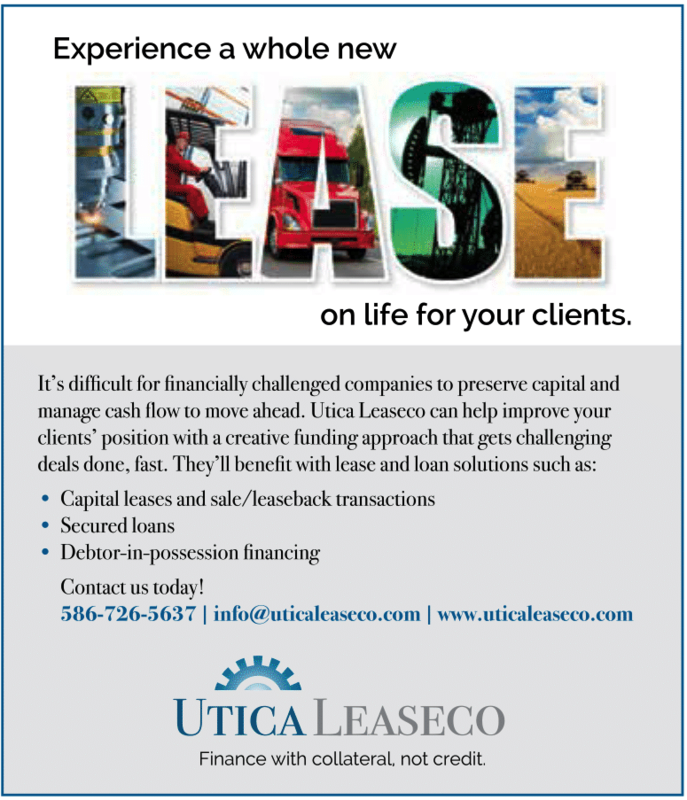 Adding to our repertoire of offerings will allow us to cross sell not just a single loan, but perhaps a line of credit or an equipment lease. This way, we can develop lasting relationships with small businesses and truly look back on the help we provided. I also intend to expand the referral partners we work with. Brokers are very valuable, but I want to broaden our relationships with others in the small business ecosystem, including equipment manufacturers and professional service providers. Lastly, leveraging my background, we plan to do a full evaluation of our marketing environment. I’m a big believer in the use of data and analytics to see who we want to renew with us. We plan to take advantage of the rich data we’ve amassed over 20 years working with our customers and credit models to target the right customers to lend to. Q: What are the lessons from your career both in and out of lending that you think will help you in your new position? A: From earlier in my career, I’ve learned some methods and discipline around execution and the pace in which you want to execute. Success is really the result of massive determined action. That’s borrowed from Tony Robbins. You’re doing a lot at once, focused on a goal and taking the noise out.